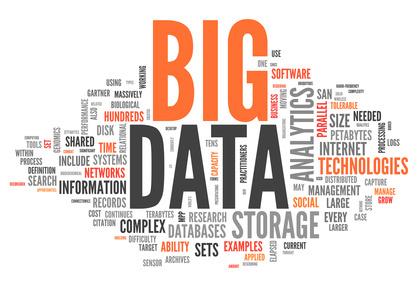 Big Data is a fairly new term that has become popular to describe the growth , availability and use of information exponentially . For IT professionals , it is important to keep an eye in the volume increase , variety and velocity of data that constitute the Big Data . In the past the volume of data created a storage problem , but with the cost of inventory falling increasingly , the major problem to be considered is the relevance of the data . The professional must learn to value these files , ignore them or overestimates them . Data today are showed in many types of formats . Some research shows that about 80 percent of the data of an organization are not numerical , but these data also need to be read , understood and used in the analysis of the company and in the decision making process . The speed described in Big Data has much more to do with the ability of the professional to receive information, reacting to it quickly and use to your advantage , that with the speed of its arrival. The speed of the facts and information has been increasing , and the difficulty of using this knowledge grows well along with the speed . According to the Bureau of Labor Statistics , about one million jobs related to big data will be created in the United States over the next seven years. Salaries promise to be bigger than IT technician today , as personal development and perception will have to be bigger too . Market analysts : they are responsible for transforming the massive amount of data into useful information to businesses . Software developers : how creative agent of tools that help in the analysis of large amount of data . Database administrators : responsible for storage and access to data already obtained . Analysts computing : responsible for integration between IT professionals and executives . Network architects and security experts : those responsible for the information secure and diamonds flowing regularly. Network administrators and systems : professional skilled at keeping everything running is essential . Along with these six areas , so does the market for university professors . The growth of Big Data must take more and more students becoming interested in such means and are the masters who will lead this whole group . Today , we have the amount of about 1.8 on zettabyte digital data in 2015 should already be with 7.9 zettabytes here three years ago and all the world’s information can be stored in 493 Billion iPads. Sources: Canaltech and SAS – Software Intelligence Analytics .